Last month I wrote one post on snow. Today, the lawn here where I live looks almost like this. In mid winter. From the telly news have just come that today had been the warmest January day in Slovenia after more than 100 years. Beware now. 15 degrees Celsius. Above zero. Despite it should be 5 minus at least, snow, ice, and all that once natural winter thingies. When I passed this building overlooking Trg republike (Republica Square) which has a huge display showing time, date and temperature, the display indeed told me it had been 14 degrees Celsius. In late afternoon. Seems things are turning insane. I had some errands to do and since I still feel slight effects of my illness, I was walking around the centre of Ljubljana slowly almost half of the day. Sunny day. Yet the sun felt so sharp. And then, this weird warmth. I was walking with my jacket open, around my neck light silky scarf I would use in spring. Some people are even wondering around in T-shirts. Others are eating ice-cream in the middle of the street. In the old town I saw one bar put tables and chairs for people to sit outside. Under that so sharp sun. The air is mild, full of sudden warm brightness. There is such an odd smell of spring. Ages too early that smell has arisen. Birds are far too loud and lively as well. 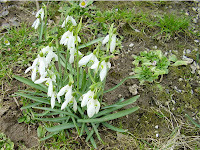 Small spring flowers, green grass growing. It feels like being in one science-fiction movie, where the city is trapped under fake atmosphere. Artificial feeling of spring. And one just cannot enjoy it, though the weather is so nice. I can still wear those trainers I was walking around with in August; yet the fact I am saving my winter shoes is not something to rejoice. I only wonder what will be going on in actual spring, as well as later in summer. Now we should really think about this fucked up climate... if it is not far too late already, eh? Today this news came from the telly. Snow and low temperatures are about to come next week! Yey!! I have to fetch my winter clothes and those thick etno-Estonian gloves I bought in Tallin! Okay, we'll see what happens... this evening the air is still too mild and still too warm for January. However, Slovenia was lucky enough to escape huricane Kyrill that swept through Europe last week. Only eastern part of the country got some portion of destructive wind. Well, again this weather is a warning... right?